A mouth watering recipe of kebabs is Lebanese kebab, with a blend of beef, veges and noodles. Everyone would love these soft and delicious kebab if you will serve them hot with dips. Heat pan and cook mince with a little salt and pepper, over very low heat till it is tender (add additional water if required). Let the mince cool bit. Boil noodles in water till they are cooked and tender. Drain their water and keep them aside. Chop boiled potatoes and peas with boiled noodles. in a chopper. When they are chopped well and mixed, add mince to the chopper with salt, pepper, onion, ginger and garlic. Chop till they are mixed well. Take out the mixture in a bowl and add fresh parsley and mix well. At this step, adjust spices according to your taste. Beat eggs with a little salt and pepper if required. Meanwhile heat oil in a pan. 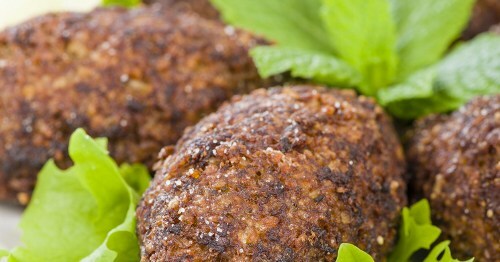 Make kebabs out of the mixture, coat them in egg and then in bread crumbs, deep fry in oil. Your delicious kebabs are ready to serve either with your lunch or with your evening tea.